Photo courtesy of Mikito Tateisi. We’re surrounded by “spiritual heroes,” men and women who in faith have accomplished great things for the Lord. Last week, my wife, Stephanie, and I spent several days with leaders of other Christian missions, and we were blessed by stories of modern-day heroes who are advancing the Gospel, sometimes in very challenging situations. Some of my heroes include Dawson Trotman, the founder of The Navigators, and Lorne Sanny, his successor. I also draw great inspiration from my two immediate predecessors, Jerry White and Mike Treneer. I could also mention many co-laborers in the Navigator work around the world today. Reflecting on the legacy of great men and women of faith should lead us to imitate their faith (Hebrews 13:7). But there is a danger: Comparing ourselves to our heroes might lead us to withdraw from serving God because we don’t think we measure up. Consider Moses’ responses when God came to him in a burning bush. The Lord called him to fulfill a seemingly impossible task: to confront the king of Egypt and to lead thousands of enslaved Israelites to freedom (Exodus 3:7–10). Put yourself in Moses’ shoes. Wouldn’t it have been extraordinarily arrogant for Moses to accept this role? That appears to have been Moses’ first thought, for he responded to God by saying: “Who am I that I should go to Pharaoh and bring the Israelites out of Egypt?” (Exodus 3:11). I’m sure I would have said the same thing had I been standing next to that burning bush. And yet, Moses was looking at the situation only through the narrow lens of his weaknesses. As a result, he said, “Who am I?” God responded to Moses by expanding his narrow, human perspective. He opened up Moses’ view by saying, “I will be with you” (Exodus 3:12). Those five words changed everything. The God of heaven and the earth would be with him, so the Pharaoh and his army could not prevail. Moses had to decide: Will I respond on the basis of my human weaknesses or will I respond in faith in God’s power and presence? We all face choices like Moses did. This story helps me see that living by faith in God’s power and promises is not arrogant. Rather, faith leads me to make room for God to act according to His purposes—despite my weaknesses. Humility leads me to submit to whatever He calls me to do, and to trust Him to help me fulfill that call. How can we focus on God’s power rather than ourselves? Paul wrote: “To those who by persistence in doing good seek glory, honor and immortality, he will give eternal life” (Romans 2:7). John Stott explains that glory is the manifestation of God Himself, honor is God’s approval, and immortality is the unfading joy of His presence. God has hardwired these three quests—glory, honor, and immortality—in every human being. The key is to persistently pursue God’s glory, not our own. Paul also said, “So whether you eat or drink or whatever you do, do it all for the glory of God” (1 Corinthians 10:31). This scripture reveals that the grandiosity or simplicity of what we do is not important. How we measure up in comparison to the spiritual heroes we admire is not important. God wants us to do everything, even small things, for one purpose: to manifest His glory to the world around us. By living for God’s glory, we avoid two dangers. First, we don’t allow our human weaknesses to determine how we serve God. As God calls us, we can step forward in bold faith, trusting that He will demonstrate His power through our weaknesses. Second, living for God’s glory keeps us from living for selfish ambitions, which is meaningless. To pursue God’s glory, we must surrender our selfishness to His will. And that is the essence of humility, worship, and meaning. Mutua is the International President of The Navigators. I had to admit it. During a day alone with God, I had to confess that I had not shared my faith with someone for a long time. Too long. I had to admit that I had wimped out on some good opportunities. So, I began praying that God would lead me to a spiritual conversation with someone every week—a conversation that would give me an opportunity to pray with a person. I prayed daily for each of our neighbors and for strangers that I hadn’t yet met. Soon I saw God opening doors for the Word! However, before long, I again began to hesitate due to self-protective worry. God kept prodding me. A while ago, I met with a fellow worker who is still grieving over the brutal murder of one of her teammates. A religious radical had killed her colleague for sharing Christ. She quietly said to me, “It took us a while to get our courage back.” But I could see that courage, joy and power was again flowing in and through her and her team. These warriors inspired me to overcome my little anxieties. Not long after, I met with other Navigators who face the daily threat of arrest and imprisonment. They asked me to pray that God would help them be strong and courageous, which I am eagerly doing. Being around them and praying for them has increased my courage. They have prompted me to ask God for help with sharing His Word. That’s what Paul asked his friends to pray in Colossians 4:3–4. God answered my prayer and opened doors for me, but in those moments, I still froze up. For example, I encountered a gay waiter who opened his heart, but I hesitated. Then I faltered while talking to a technical assistance employee at a large store who shared about her tattoo. After both of those opportunities, I thought of brilliant spiritual things to say. But it was too late. As we drove away, I started laughing. God had answered my prayer through a rear-end collision! How kind of Him? Yes, how kind. Since that accident, God has opened the door to ongoing conversations about faith and grace with the driver. I feel like I’m unstuck. But I’m still praying Paul’s prayers in Colossians 4 and Ephesians 6 for myself and for other Navigator disciples and disciple-makers around the world. I’m praying because this will never come naturally for me. I need supernatural help. Don’t you? David is an International Vice President of The Navigators. He serves our 5,000 staff in more than 100 countries by coaching leaders and leading change. David is author of Don’t Waste the Pain. Joe Maschhoff (right) and Anthony in Santo Domingo. On the outskirts of Santo Domingo, the bustling capital of the Dominican Republic, a young man born into dire poverty is now leading people within his network of family and friends to Christ. Anthony’s life hasn’t been easy. From the time he was born, he has faced every economic obstacle imaginable: a broken family, scarce transportation to reach schools, little money for books and meals. It’s remarkable that Anthony survived his childhood. Today, despite his country’s high unemployment rate, Anthony has a job as a computer programmer in a bank. He recently married Gleni. Thanks to God’s faithfulness, they have been able to purchase a small starter house in a middle-class neighborhood of Santo Domingo. People around him admire his wisdom, character, and godly lifestyle. In fact, two of his bosses say that Anthony mentors them. Anthony’s story also demonstrates the power of God to multiply the lives of His followers, to produce spiritual generations through life-to-life outreach and discipleship. 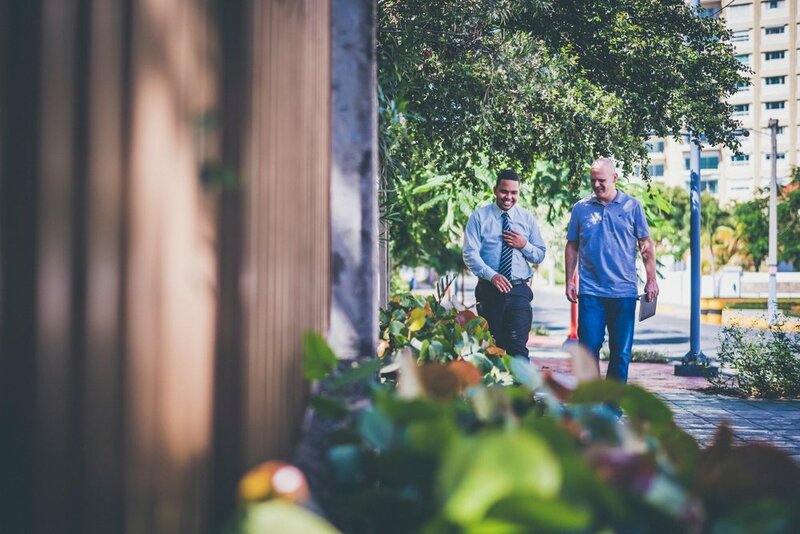 Joe Maschhoff, a pioneering Navigator missionary in the Caribbean, first met Anthony about four years ago at a men’s conference and later invited him out for lunch. During the meal, Anthony agreed to read the Scriptures with Joe, something that Anthony had never done before. They studied regularly over several months and developed a close friendship. As Anthony learned more about the Gospel of God’s grace, he enthusiastically started his own Bible studies with friends and colleagues. Some have been living on the edge of poverty. More and more people are getting to know about Christ through Anthony’s initiatives. Joe has also helped Anthony strengthen his connections to Navigators in the region, giving Anthony more opportunities to develop a deeper understanding of biblical leadership, and to participate in regional missions efforts. Anthony is just one example of how God is producing spiritual generations throughout the Caribbean. The Navigator work in the region started only four years ago. And yet, in January, more than 40 men and women from five Caribbean nations attended a Navigator forum designed to encourage and equip a new generation of Christ-followers. I believe this first generation of Caribbean Navigators will go on to reach many people who will in turn produce a second generation of believers. That is how God works. We pass on our knowledge about God from one generation to another (Psalm 78:1–8). As Paul said in 2 Tim 2:2, we hand the good deposit of the Gospel to faithful men who are able to teach others. Jesus, envisioning the next generation, prayed that many would believe in Him through the message of His disciples (John 17:20). Through Joe and his pioneering team, God is establishing a foundation for the Gospel to flow into the Caribbean cultures and to establish spiritual generations. God is transforming families and marriages, which is crucial to reaching the highly relational Caribbean culture. Please pray that God would continue to protect this generation of believers in the Dominican Republic, Haiti, Cuba, Jamaica, and Puerto Rico—and use them to advance the Gospel in the region and around the world. Alan is a member of the International Executive Team. After serving as country leader for Malaysia, Alan was selected as the regional director of the Asia-Pacific work. Alan is married to Connie and they are blessed with three adult sons. Jeremie Agre (left) performs hundreds of eye surgeries every year in rural areas of Côte D’Ivoire. 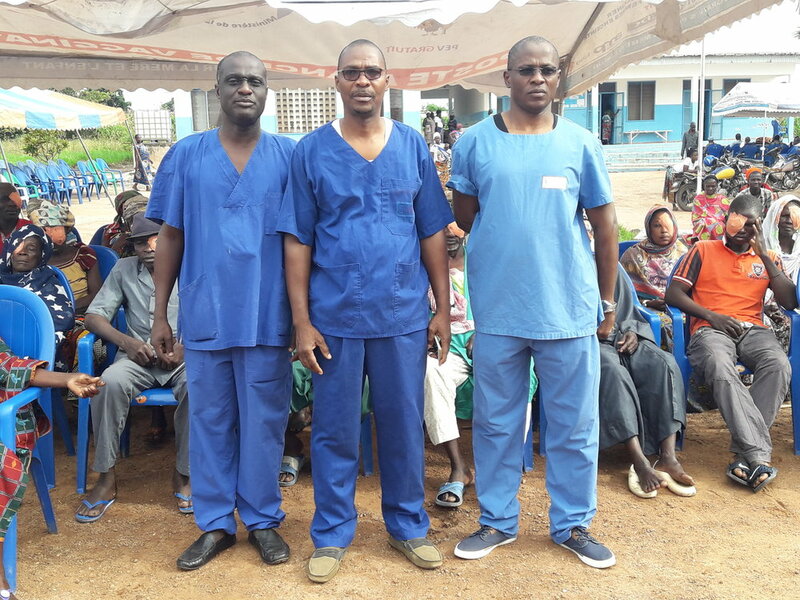 In a rural area of Côte D’Ivoire, eye surgeon and Navigator Jeremie Agre (left) gives sight to hundreds of people who have been blinded by cataracts. Jeremie is one of only 30 eye surgeons in a nation with 22 million people. And he is the only glaucoma specialist in the country. In addition to his work in rural areas, Jeremie also treats 15 to 20 patients a day in an urban clinic in Abidjan, the country’s capital. This work includes eye exams, laser treatments, and cataract and glaucoma surgeries. He also spends a lot of time teaching the Scriptures, discipling believers, and coaching Navigator leaders. A few years ago, his oldest daughter asked him, “Daddy, who are you? Are you a doctor or a pastor, because sometimes you preach and lead Bible study as well as work as a doctor?” Jeremie responded by saying that being a doctor and teaching the Bible are part of the same calling. “The Lord gave me a gift to care for people whether they are in ministry or sick,” said Jeremie.